A giant observation wheel is set to roll into Worthing this Easter. Residents and visitors will get the chance to go spinning high in the air as the temporary attraction is brought to Steyne Gardens. Standing at 35 metres high, the wheel is one of the tallest transportable attractions of it’s type currently available in the UK – giving those boarding the chance to see up to ten miles in the distance. The 144-capacity attraction is set to operate from late March to mid April, which includes the Easter holidays. 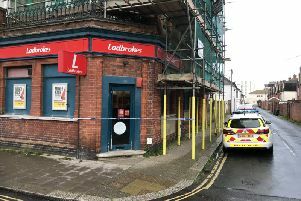 As well as bringing many tourists into the town, the attraction is expected to generate revenue for local businesses as well as rental income for Worthing Borough Council, a spokesman said. Councillor Kevin Jenkins, Worthing Borough Council’s executive member for regeneration, said: “I’m delighted to welcome this exciting temporary attraction to town. “Observation wheels are a proven popular attraction for people of all ages. “It will become an instant landmark for everyone in the town, as well as giving people the chance to see Worthing from an entirely new perspective. The 24-pod wheel, which is silent when it spins, will operate between 10am and 10pm, seven days a week. It will be run by the Giant Wheel Company, who are based in Manchester and have brought similar attractions to cities across the UK. Within the agreement, the company will construct the attraction using a 105-foot truck-mounted crane. It takes two days to build the wheel and one day to dismantle. No planning permission or licensing approval will be required as the wheel will be in place for less than 28 days. Other locations, such as the seafront and Beach House Grounds, were considered, the council spokesman said. But the excellent links and accessibility of Steyne Gardens made it the preferred location, the spokesman confirmed. Councillor Diane Guest, Worthing Borough Council’s executive member for environment, said: “I believe this is an excellent use of our town centre open space. “Some people may be concerned at the potential impact the wheel could have on the park. “But Steyne Gardens has a track record of hosting events and pop-up attractions, such as the ice rink, festivals and concerts. Partners such as the Worthing Town Centre Initiative, Worthing Hospitality Association and hoteliers at the Chatsworth and Ardington have been informed. Letters are also being sent to local residents. Sharon Clarke, of the Worthing Town Centre Initiative, said: “We are pleased to see a Giant Observation Wheel coming to Worthing. “Having a new attraction over the Easter period will bring people into town which we know will also increase footfall for the town’s businesses.